What’s Included: 7 nights, daily breakfast and dinner, group transfer from/to the airport; English-speaking guide, bicycle rental, all entrance fees, support vehicle, and our famous t-shirt. 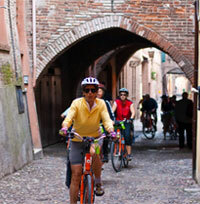 …is amply comfortable as the hotel that travels with you for an Italy Bike and Barge Tour. The name of the barge means “Life is a battle” in Italian. 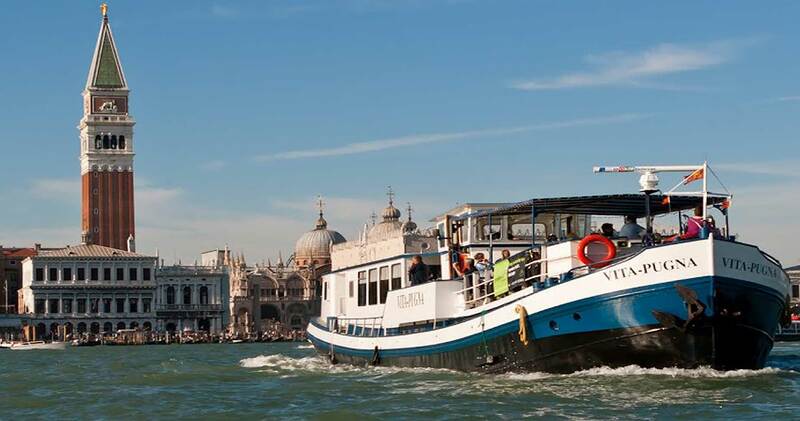 It’s not your battle; however, aboard the Vita Pugna or from the vantage point of a bicycle as you venture from Venice to Mantua. All you need do is enjoy. Venice everyone knows about, whether they’ve been there or not, but even the blasé succumb to its special enchantment when within that water-threaded city. We’ll have a morning guided walking tour there, with stops at such must-sees as the Doge’s Palace and St. Mark’s Basilica, giving you a sense of the geography that will prove handy when you’re on your own to explore in the afternoon. Options abound – water taxi on the Grand Canal? Splendid art in the many churches? A gondola ride, complete with serenade? People have been having fun in Venice for centuries, and shopping is some people’s idea of fun. Venice is ready. Mantua (Mantova to the locals) is a better kept secret but very strong on palazzi; the dukes of Gonzaga lived well. Medieval buildings share the streets with architecture of the Renaissance and it all looks splendid. While we are in Mantua a local historian will take us around this influential center of Italian Renaissance art and learning, once the home of the powerful Gonzaga rulers. In between these two individual and deeply interesting cities we will be bicycling – like many of the Italians themselves – in the countryside and small towns, meeting up with the barge at a dock at the end of the day. Tourism is not the major industry in many of the towns we go through, which means we will be among the locals rather than the tourists, but doesn’t mean that views or architecture or interest is lacking. It was necessary to build a fortress several centuries ago in Ostiglia, for instance. The fortress still is there. In the village of Bergantino we’ll visit the Carousel and Street Entertainment Museum, highlighting a subject not often explored. A cheese tasting will be another special experience, centering on the famous Grana Padano cheese in its various forms. 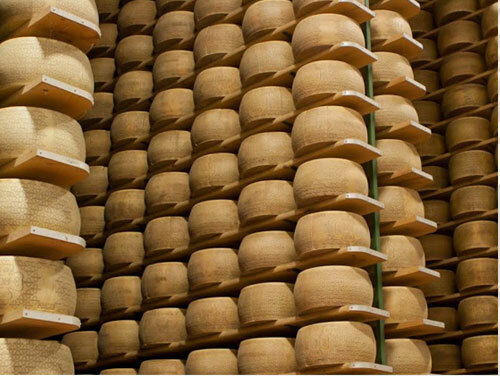 Item of information: a wheel of Grana Padano can weigh up to 88 pounds! Ferrara is not an unknown name, for good reason. It’s a UNESCO World Heritage Site and the family who made its mark there was the d’Este dynasty. Their 14th-century castle, suitably surrounded by moat, is in the center of town and the city walls are 500 years old. We will have a walking tour there and learn about the d’Este, who had their own ideas on how to conduct business and inheritance and all the trappings of money. Directly, was their method, with the caveat that the strongest, the wiliest should win. But they left some handsome buildings in their wake. The ride along the coast takes us through an environment shared by flamingos and heron, handsome adjuncts to the scenery. One of the treats of this tour is docking for a night in the ancient town of Chioggia, which mirrors Venice in miniature with canal/streets. Historically, in Chioggia, the men are fishermen and the women make lace. History in Chioggia is also modern day fact. A bell tower in what passes for a modern (18th-century) church, St. Andrew, has a bell tower from the 11th or 12th century, because there’s no need to replace something that still works. 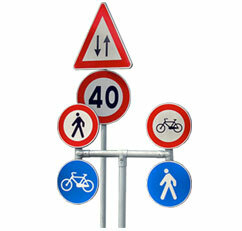 This tour is marked by easy cycling, and has the barge-advantage of eliminating constant packing and unpacking. Breakfasts and most dinners are also on the barge, where the cooks know exactly how to please hungry cyclists. IBT provides coach transportation to and from the airports at beginning and end of the tour: Verona’s Villafranca Airport for Mantua and Venice’s Marco Polo Airport. This is a tour that may come back to mind whenever you go to your favorite Italian restaurant at home. It has the essence of Italy.